Signed by 1,000 Aboriginal people, the 1972 Larrakia petition is one of the most important documents in the history of their struggle for land rights. What is the Larrakia petition? The Larrakia petition is a document signed in October 1972 by 1,000 Aboriginal people from all states and territories of mainland Australia. Some signed with their name, others with thumb prints . Dr Bill Day, an anthropologist, helped create the petition. He posted it to Her Majesty Queen Elizabeth II. It draws its name from the Larrakia people who are the traditional owners of the Darwin area. Tessa Ferguson and Edwin Jangalaros presenting the Larrakia petition outside Government House, Darwin . The petition was more than 3.3 metres long and made of numerous sheets of paper joined together. 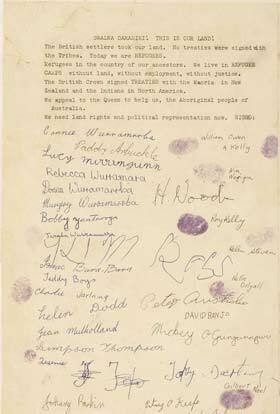 A page of the Larrakia petition with signatures and thumb prints of Aboriginal people. More than 1,000 people from all over Australia signed the document. Why is the petition so significant? Triggered by the walk-off at Wave Hill Station in 1966 Aboriginal people started their fight for land rights in the early 1970s. In the Larrakia petition Aboriginal people argue that their land was taken by the British settlers and they signed no treaty to acquire it. But without their land they are but refugees in the country of their ancestors. They call for land rights and political representation for the Aboriginal people of Australia. The petition's heading reads Gwalwa Daraniki which means 'this is our land' in the language of the Larrakia people. They wanted to publicise the struggle for land rights and to put pressure on the Australian government. 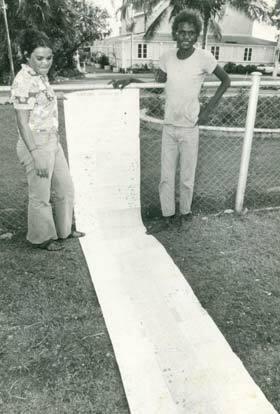 Representatives of the Larrakia community originally attempted to present the petition to Princess Margaret during her official visit to Darwin in October 1972 by breaking through the police barriers. As a scuffle broke out the petition was torn – an incident, Dr Day says, that symbolised the struggle Aboriginal Australians faced. Later that month, Dr Day and representatives of the Larrakia people posted the petition to the Queen, with an accompanying letter that offered an apology for the poor condition of the document. The petition was eventually forwarded from Buckingham Palace to the office of the Australian Governor-General, Sir Paul Hasluck, in early 1973. From there it was placed on file in the Department of Aboriginal Affairs before being deposited with the National Archives of Australia in 1975. This was not the first petition organised by Aboriginal people in the Northern Territory, nor was it the first by the Larrakia people . In 1963 the Yolngu people of Yirrkala presented a bark petition, unsuccessfully seeking rights to their land. In March 1972, seven months before the Larrakia petition, Gwalwa Daraniki sent a petition to the Prime Minister seeking a government commission to negotiate treaties with Aboriginal people. The year 1972 was an important one in the history of Aboriginal land rights. After the McMahon coalition government refused to recognise land rights, the Aboriginal Tent Embassy was set up on Australia Day that year and attracted a blaze of international publicity.